The earliest record of the name Bockendon Grange is 1262. In the 1150s, Henry II gave land at Westwood Heath to the Cistercian Monks of Stoneleigh Abbey, for the purposes of farming and they established a farm at Bockendon Grange. There are additional records of a hamlet, here at Bockendon, dating from 1325. There is little to see on the surface today, apart from some hilly mounds, which formed a moat. And the ground is very boggy in places, where a stream runs out of Burton Green wood. The buildings in the background of this photo are the present Bockendon Grange Farm, which has been rebuilt since medieval times. There is also some evidence of fish pools, created by the monks, still remaining. There is no public footpath through the area of the fish ponds, so I haven't got a closer photo. "My 6X-great-grandfather, Catesby Oadham (1687-1722), left this property to his daughter Mary Oadham in his will. She left it to her son Richard Purvis and it continued for another couple of generations in the family. Some of them styled themselves as "of Bockenden Grange", but it's unlikely that any of them lived there. "Catesby was the son of a mercer and mayor of Coventry of the same name. He himself travelled to London and petitioned to be an assay master at the Royal Mint, but Sir Isaac Newton wouldn't have him; he travelled to Madras where he became the assay master, and Mayor; it's possible that he'd never have even seen Bockenden Grange. His daughter Mary was born in Madras, but married in England." This is Cromwell Cottage, probably the oldest building in the district. Cromwell Cottage is at the far end of Cromwell Lane, by the railway station, and now lies within the Coventry boundary. Cromwell Cottage is just one of the two buildings in Burton Green that are mentioned in Pevsner's Buildings of Warwickshire. 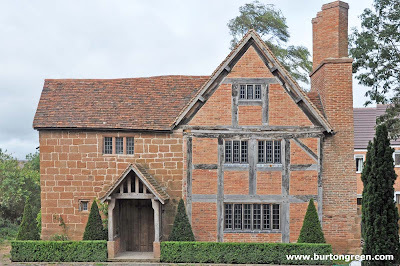 Pevsner merely says that Cromwell Cottage is built of stone, with brick infilling. He gives no estimate of the date of the building. "Dated 1653 on porch but may be earlier. Local tradition derives name of cottage from a visit by Oliver Cromwell. Timber frame and brick, stone section on left. 2 storeys and attic, gable on right. 2 triple light C19 casement windows. Old tiled roof with diagonally set shafts to C17 brick chimney stacks." If there is a real connection between Cromwell Lane, and Oliver Cromwell, then this building is the most likely reason. The building is currently in the process of renovation. According to The Place Names of Warwickshire, the first reference to Westwood occurs in 1250 in the Stoneleigh Rolls. The ecclesiastical parish of Westwood was constitited in 1846, two years after the construction of Westwood Heath Church. According to the census records (1841-1911), the road currently known as Westwood Heath Road was originally known as Canley Hill (1851), then Cox's Hill (1871, 1881). The name Westwood makes its first appearance in the census in 1891, though part of the road was still referred to as Cox's Hill. In the 1911 census, part of Cromwell Lane, between Tile Hill Station and Arnold Farm was also referred to as Westwood Heath. The whole area of Westwood Heath and including Fletchamstead, Canley, and Tile Hill was originally part of the Stoneleigh Estate. 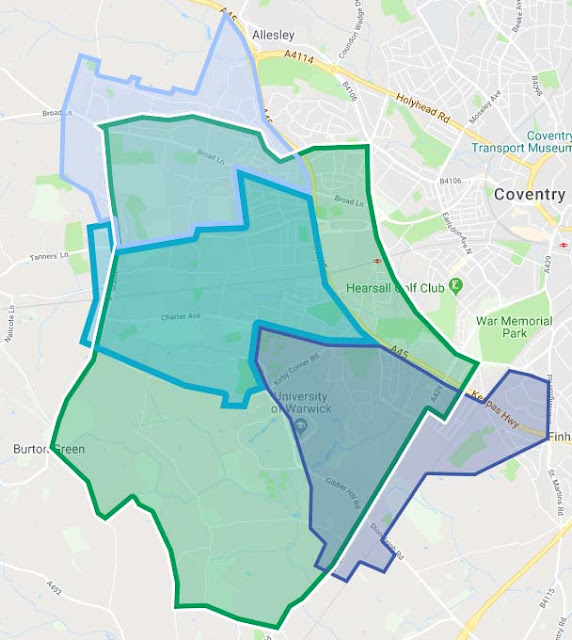 Westwood, Fletchamstead, Canley, and Tile Hill became part of Coventry in 1927, under the Coventry Corporation (Boundary Extension) Act 1927. The land was purchased from the Leigh family by Coventry Corporation. The sale of the Stoneleigh Estate was caused by reasons similar to the sale of many large country estates in the period following WWI. "In 1279 the Master of the Temple [Knights Templars] held Fletchamstead as a hamlet of Stoneleigh... In 1293 an arrangement was made by which the Templars gave up their rights of pasturage in the manor of Stoneleigh in return for a grant of 200 acres of waste land in Westwood. When the Order of the Temple was suppressed the Abbot of Stoneleigh seized the chapel lands, but later made them over to the Knights Hospitallers. The estate was then made a member of their Preceptory of Temple Balsall ... At the Dissolution the estates of Temple Balsall were given to Queen Katherine (Parr), including the manor of Fletchamsted, which was granted in February 1545 to John Beaumont, who at once assigned it to William Humberstone. Four years later Humberstone made a settlement of the house, chapel, and lands on himself and Dorothy Spryng, his intended wife. They sold the manor and chapel in 1564 to Sir Thomas and Dame Alice Leigh, whose son Sir Thomas built a fair house there and made a park. The property then descended with the main manor of Stoneleigh." The old Fletchamstead Hall was in the present Torrington Avenue, near the far end of Wolfe Road. There are also several modern place names with Templar references in the vicinity - Templar Avenue (off Torrington Avenue) and Templars School. The 200 acres at Westwood Heath granted to the Knights Templars was a considerable proportion of Westwood. By comparison, the recently planned housing development at Westwood Heath is approximately 40 acres. 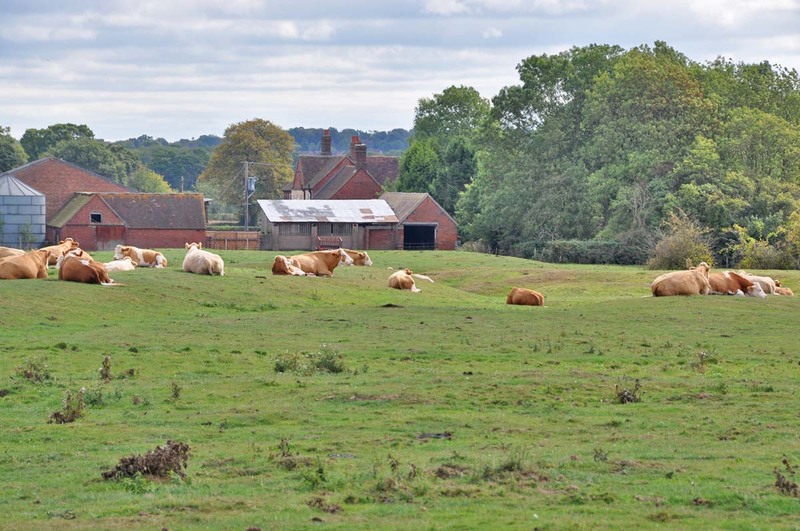 Westwood Heath Farm occupied 540 acres (extending over Canley). There is also a record of Jaques de Molay, the Grand Master of the Knights Templar, assenting to a right of way from Berkswell to Stoneleigh, in the "waste of Westwoode". This was presumably the road that was to become Westwood Heath Road. The ecclesiastical Parish of Westwood was constituted in 1846. This map shows the approximate boundary of the ecclesiastical Parish. The Parish covered much of Burton Green, Tile Hill, Canley and Fletchamstead, with Westwood Church at its centre. The area of the Parish was approximately 5,200 acres. 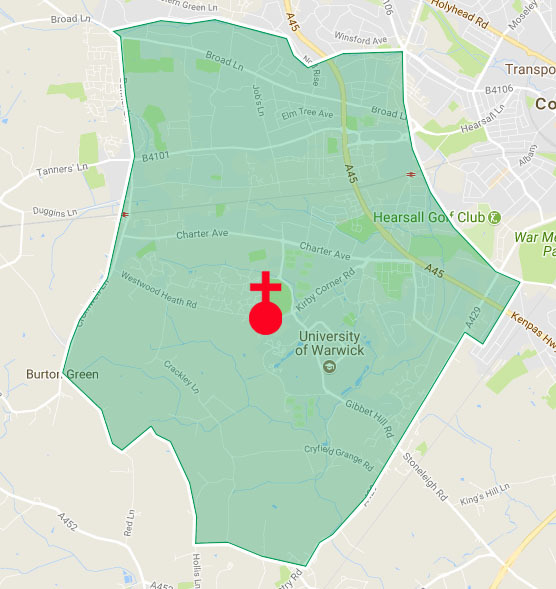 The map below shows how the ecclesiastical parish of Westwood in 1846 compares with the present day wards of Woodlands, Westwood, and Wainbody. Those 3 present day wards together correspond approximately to the Northern part of the old Westwood. There are a few anomalies around the edges. For example, the North-East boundary of Westwood, and Wainbody wards is now the A45; but that road didn't exist in 1846. Westwood is the green area on the map. Woodlands, Westwood, and Wainbody are superimposed in blue. The following article was written by Mr C F Neale, who was headmaster at Westwood School between 1881 and 1911. It was published in the Coventry Herald, on 27th May 1927, when Westwood was about to be purchased from Stoneleigh by Coventry Corporation. 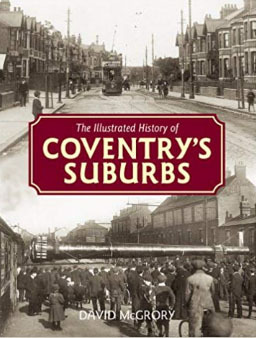 "Coming events cast their shadows before," and if things turn out according to schedule, the greater part of Westwood will be merged in the City of Coventry on 1st April, 1928. Such being the case, it may be an appropriate time for a few reflections. Westwood is an ancient name, mentioned in the Ledger Book of the Monks of Stoneleigh, 1392. This is an extract: "And thence from the said vennel (lane) near the tenement which is called the Hollies, the bound is the King's highway itself leading to the Hale, till we come to a certain ditch between the Hale and Bokyndene. And thence the ditch itself going about the Closes of Boknydene towards Berkswell. And from thence the bound of the manor is a certain way dividing Westwode and Berkswell. And from that way is another way hard by the long ditch which divides Berkswell and Westwode." Before the Reformation, there were two outlying communities of Cistercian monks living here, dwelling at Boknydene and Flechamstede. An ancient map on a large scale. of Coventry and district may be seen hanging in the British Museum with the two names in large print. The ruthless Henry VIII destroyed the monasteries and nothing but their names survive. Westwood, so well wooded to-day. formed a part of that forest of Arden between the Roman roads of the Fosse Way and Icknield Street. The Moat in the Canley district is a survival of that period, but its origin is lost. The old house there was the birthplace of one Henry Parkes, who, emigrating with his parents to Australia during the " bad old days," rose to be Sir Ilenry Parkes, G.C.M.G., many times Premier of New South Wales, and popularly known as the G.O.M. of Australia. Much less than a century ago there was no church, school, or railway in Westwood. Many dwellers, having built their own habitations, worked on the farms, and supplemented their earnings by pasturing donkeys, pigs, and geese "on the heath." To come to 1887 or so, Westwood had then 600 people, all, with few exceptions, engaged in agricultural pursuits, and small enough for the people to know each other by sight and reputation. The well-known farmers were then: Messrs. Thomas Hands, William Campbell, Edward Swinnerton, Arthur Silk, Thomas Hollier, Anthony McMillan, Thomas Lea, Thomas Mackay, James Harris, George Hammerton, George Lea, William Sammons, and James Jenkinson, all of whom, in varying ways, were sympathetic in the well-being of village life. With the exception of Mr. Hammerton, who has left the district, all have passed away. It will be seen, however, in many instances the names happily survive to the present day. Tile Hill, to the north of the railway, consisted of about a dozen families, loyal supporters of their parish, identifying themselves with all that was going on. En passant, it may be said that the word "Westwood" was not too well-known outside its boundaries. To the watchmakers of Spon Street it was Kirby Corner; to those who went up and down the line it was Tile Hill; to civil dignitaries it was Stoneleigh; to the postal mandarins it was Westwood Heath; to the children in Chapelfields and Earlsdon it was " the place where the waterfall field is" and "where the bluebell woods are." And, to add to a new-comer's confusion, the dwellers in Broad Lane, Whoberley, Burnt Post, Hollies, Canley. and Cryfield generally used the names of their own particular corner in conversation, so the plaintive question of the new-comer would be, looking in vain for a centre, " Where is Westwood?" A feature of that period was the fixed tenure of village life. The same names appeared for a generation in the persons of the farmers, the villagers in "free" collages, churchwardens, schoolmaster, postman, policeman, stationmaster, sexton, and innkeeper. Following the lead of its noble landlord, the village was Liberal to the core, and its colour, " blue " of the deepest dye; but the number of those entitled to vote barely exceeded 100. and they had to travel eight miles, counting both ways, to exercise the franchise. And so on to this present year of grace. Westwood is in the melting pot, changing visibly almost each month. It may be compared to an octopus, somewhat lifeless in the centre, with lively tentacles reaching out on all sides. The population exceeds 2,500, and the voters number 1,044. The centre of the village remains as in former years, while all types of houses are built on the borders. One frontage may be a modern motor works, another a row of small dwellings, others a succession of villas in various designs, or a Liliputian garden city. Then comes the inevitable shopping centre, and the appearance of the suburbs of a large town, its sight, supplanting those of the farm roller and the sportsman's gun. About nine-tenths of the people will be adopted by Coventry. We shall form a part of "no mean city." One to which many of us are bound by ties of birth, occupation, sport and youthful memories. The following history of Westwood Heath is taken from the book The Illustrated History of Coventry's Suburbs by David McGrory. "Simply meaning 'the west wood on the heath', the district of Westwood Heath is still semi-rural. In the 12th century Henry II gave land here to the monks of Stoneleigh Abbey. It is said that when the Cistercians first came to the area in the 1150s they established a grange farm, which seemed to exist mainly to exploit the surrounding woodland. Opposite the site of what is generally thought to be the original Bockidene Grange in the present woodland called the Pools they dug their fish ponds, traces of which can still be seen. Remnants of the large woodland that once covered the area include Whitefield Coppice, Broadwells Wood, the Pools and the Black Waste Wood, once the Black West Wood. The grange moat was over 30ft wide and kept the fish ponds full of water. There were once two buildings of uncertain age inside the moat, but the large size of the site and the lack of archaeological evidence of habitation has led some to suggest that it was a moated orchard or rabbit warren. There was once a hamlet here, for in 1325 the abbot of Stoneleigh forced 25 of his tenants to abandon their homes. Nearby Hurst and Cryfield were also affected. 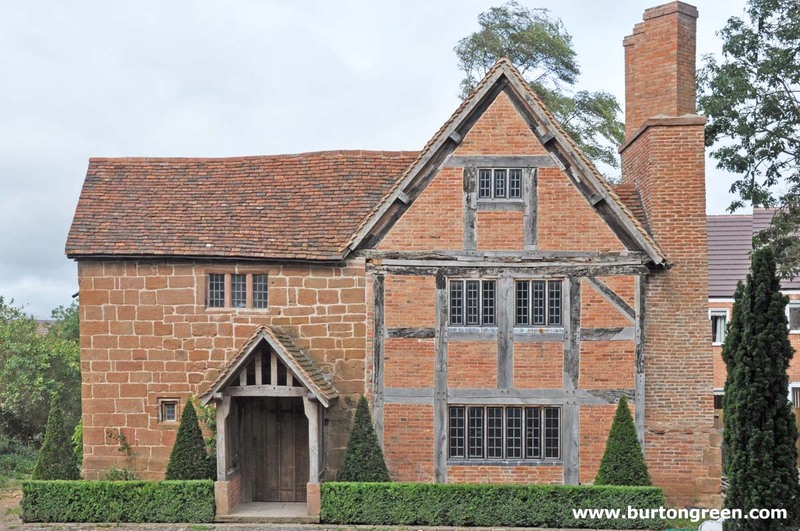 Hurst, once described as a pretty village, consisted of only one house in the late 15th century. It is thought that the monks stopped using the site by the end of the 14th century and leased it. Experts believe that Bockendon Grange Farm, surrounded by a smaller moat, may have been the original grange farm. Although the present building dates back to the 18th century there are possible traces of mediaeval work. Behind Bockendon Grange Farm is another small moat that appears to have been created over ridge-and-furrow near the original settlement site. Further down the lane is the site of what is thought to be the lost village of Hurst. The front seats were occupied by farmers and their families. Then came the middle seats for the craftsmen of the village; thirdly the agricultural labourers in the rear. This segregation was accepted ... Occasionally stray visitors came early to the morning service and unwittingly entered a front seat. To their consternation they were hauled out by the sexton and were conducted to a lower seat. The foundation stone was laid by Chandos, Baron Leigh, and the first incumbent was the Revd Edmund Roy who lived in the High Street, Kenilworth. The Revd Roy rode to Westwood on a white pony and had a room in a house near the church. He appears to have been a great believer in the efficacy of wine and always kept a large stock in his room, ostensibly for the use of invalids. Revd Roy was a kindly man who believed whole-heartedly in education and set up a library in the village for adults and children that was still in use before World War One. He resigned the living because of ill health in 1871 and was followed by Revd Russell, who in 1877 was succeeded by the bizarrely named Revd John Octavius Coussmaker, known by the villagers as Mr Coachmaker. The Revd Coussmaker was noted for his good nature and easy-going manner, and his lack of punctuality. On two occasions the congregation stood for an hour waiting for him to arrive. On the first occasion his excuse was that he had been removing a dead man from a ditch at the vicarage. On the second occasion he claimed to have been attacked by the vicarage bees and temporarily blinded. ... had he not been in his accustomed place at the service, people would have expected the heavens to fall. Oh, oh! how the harmonium droned in those distant days! The congregation consisted of staid persons, who had mostly lived in the parish all of their lives, who did not marry or give in marriage, or run after enjoyment, but just stopped by their own firesides, in homely fashion, and were, I suppose content. Father was a farm worker and forester and mother did housework for the headmaster and made butter at the farm. Our lovely three bedroomed cottage had a large lawn 0 to the front and a vegetable patch with apple, pear, damson and plum trees ... Each year the owner, Lord Leigh, would arrive on horseback to make his inspection, and award prizes for the best kept cottage and garden. The old post office was a few doors away (and bears the crest of the Leighs). For 46 years it was run by Emma Smith, who finally retired at the age of 79. As a girl Esther remembered that the only other shop at Westwood was next to the smithy. Here she would buy sweets from Bumper Jones; while the smithy was always a favourite with children, who loved to watch the sparks fly. Esther recalled, 'George Duggins senior spent one half of the week at the little smithy in Westwood, and the rest of the week at the other in Duggins Smithy, a few miles away in Tile Hill.' She also remembered that the school (now the Greek Orthodox Church) was built in 1870. It had three teachers and the head's house was next to it. There was a flower garden for the girls and a vegetable plot for the boys. The big event of the year was Empire Day when Lord Leigh visited. The school was decorated and Lord Leigh was entertained by maypole dancing in the schoolyard, for which he rewarded the children by giving them the afternoon off. 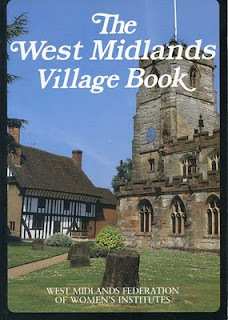 A fairly comprehensive article about Burton Green was published in 'The West Midlands Village Book'. 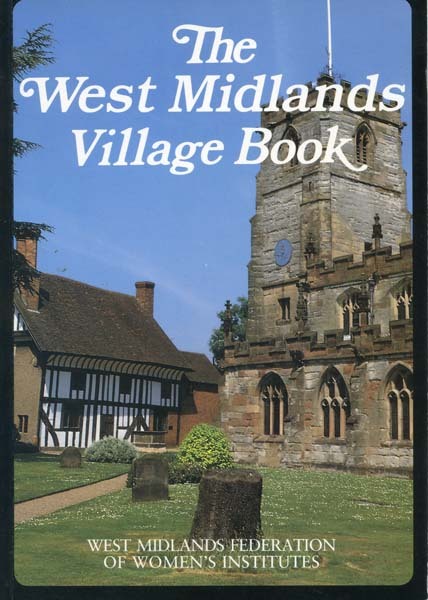 This book was published in 1989, and includes articles about most of the villages within the administrative area of the West Midlands. The book covers the metropolitan area of Birmingham and Coventry. It excludes Warwickshire. The book was published by the West Midlands Federation of Women's Institutes. The author of the article was a local resident, but their name is not given in the book. Burton Green is a quiet village situated in an elevated position in the green belt on the edge of the industrial city of Coventry. In about 1500 the boundary between Warwickshire and Berkswell ran down the middle of Cromwell Lane, one of the village’s main roads. This line of demarcation still exists so that the services (refuse collection, water, electricity, etc) of this tiny village are administered by different authorities, now Solihull District Council, Warwick District Council and Coventry City Council. The population has grown gradually since the Second World War. Some of the older residents temporarily sheltered in the village during the bombing of Coventry and later put down roots here. Since then the pattern has been to build larger, more expensive houses for professional people attracted to the village because it is within easy access of towns and cities of the region but is still in a pleasant rural setting. A railway used to run non-stop through the village, from Balsall Common to Leamington. The disused railway track which bisects the village affords elevated panoramic views of the surrounding countryside, and provides an area of interest and beauty where flora and fauna (including rare wild orchids) are preserved. The whole area around the village has an extremely high water table and even in drought conditions, water can be found less than one metre from the surface of the ground. In fact, the field at the confluence of the three lanes is the last and final outcrop of the Pennine Chain, the main watershed of England that runs on a north-south escarpment and determines the weather on both the western and eastern sides of England. This field is visibly humped or curved, one side draining down to the Wash and the other to the Bristol Channel. Burton Green Church of England primary school is unusual on two counts. Although the bulk of the site stands in the parish of St Nicholas’ church, Kenilworth, the peculiar boundary arrangements which affect the village are also evident here, as children on opposite sides of the playground stand in Berkswell parish and Kenilworth parish respectively. Secondly, the school was built in 1875, both as an educational institution and as a chapel of ease. In days when horseback was the fastest mode of transport, the building made it easier for the villagers to attend a church. Therefore services have been held at the school for over a hundred years, and are still held monthly. The water tower in Cromwell Lane dominates the landscape and can be seen from miles around. It is known as the Tile Hill Water Tower and was built in 1932 by a German firm, strangely enough escaping damage during the bombing of Coventry. Access to the tank and roof is by a spiral staircase which passes in a tube through the centre of the tank. The tower is used to serve the local area with water, but its main use is to hold water at a high level (above the roofs of the houses) so that there is a good ‘head’ of water flowing in the pipes serving Coventry. Red Lane Reservoir was built in 1966 and is situated on the west side of Red Lane near Burton Green. Inside a fenced enclosure stands a reinforced concrete, rectangular, semi-sunk reservoir which has grassed-over banks and roof. This underground reservoir is capable of supplying Kenilworth and Warwick. On a map of the area c1500, at present in the Warwick archives, the road from outside the school to the top of Red Lane is not called Hob Lane but ‘Dirty Gap’. One local historian claims that the name derives from a time when trees were being felled and taken to a tannery at the bottom of Red Lane, where their bark was used to produce dyes. The logs were dragged by six horses, resulting in the road becoming churned up and muddy and thus called ‘Dirty Gap’. The area next to the Massey Ferguson factory is where Oliver Cromwell gathered his troops as he prepared an assault on Kenilworth Castle during the Civil War. Here his army raised its banners and the road has been called Banner Lane ever since. Cromwell led his men from their assembly point and up the lane which now bears his name. When his soldiers turned left into the cart track which led to Kenilworth Castle they encountered a skirmish party of Royalist troops. It is said that a fierce battle ensued with many wounded and killed and the place ran red with blood, providing the cart track with the name it has since been known by — Red Lane. However, a more practical, but less romantic, explanation for the name is offered by studying the physical geography of the area, which appears to be rich in red clay. In fact the redness of the soil is not clay at all but rotted Midland red sandstone, which is the material that has been used for centuries to build many public buildings, including Coventry Council House and the old Coventry Cathedral. The pound by the railway bridge in Cromwell Lane is where animals used to be kept and at its centre was the old village well, which was 120 ft deep. It was only covered with boards until 1975, when a six-inch thick slab or ‘raft’ of concrete was placed over the Well to prevent accidents. When King George V and Queen Mary visited Coventry they would stay aboard the royal train overnight in the railway cutting with policemen guarding all the bridges. It was a common sight to see the Royal couple walking along the banks in the morning, collecting primroses and other wild flowers. The confluence of Cromwell Lane, Hob Lane and Red Lane was a point on the old cattle droving road from the Welsh hills to London. The cattle had usually been on the hoof for some days before they reached the ?elds near the end of Windmill Lane. Here they were rested in order to feed and gain in weight and strength for the remainder of the journey. After three or four days in which to recover the cattle often became very lively and frisky and their drovers had great dif?culty in catching them. That particular resting place thus became known as ‘Catchems Corner’. In the 1930s it was a long straggling village. There were single houses, semi-detached bungalows and groups of houses, with many gaps between which, since the Second World War, have been filled in. There were no footpaths and no street lighting, two shops, a public house and a school. The Peeping Tom pub started as a cottage and was originally a free house until the breweries took it over. In the early days of the ‘Tom’, a Mr Docker who had a fishmonger’s stall in Coventry Fish Market would bring his unsold fish to the pub and sell it off — there were no refrigerators in those days! The property known as The Hollies was built in 1858 to replace three cottages in the adjoining fields. As they were part of the Stoneleigh estate, they were built to the design of the then Lady Leigh. During the Second World War, ‘Seatons’ field was the site for many caravans for folk who had been bombed out of Coventry, either as permanent living quarters, or just as a safe dormitory away from the city. The village hall in Hodgetts Lane was built in 1923, on land given by a Miss Palmer of a local farming family. It was used for all the village activities until 1982, when a new hall was built at the rear - the site of the old hall is now the car park. During the late 1950s and early 1960s, a resident in one of the cottages in Hob Lane, being a railway buff, laid down a narrow gauge railway complete with station, and occasionally held open days for charity. When he left the area, the line was lifted and the locomotive, The Doll, was given to a steam railway preservation society. After the Second World War, car production in Coventry rocketed and space was needed to store cars and tractors, the latter coming from Massey Ferguson, Broad Lane, and cars from Standard Motor Works in Canley. A large proportion were stored behind the school, being taken by Canley Car Delivery Services. In the early 1950s, a local farmer, Mr R. Mackay, sold several acres of land to the local Electricity Board - this became the sports ground with access in Cromwell Lane. In conclusion, Burton Green has reverted to its state of semi-isolation, due to the closure of shops and deterioration of public transport, but still retains its inherent individuality.